Team Lightning - Nutritious & Delicious: Desserts! Join us for this monthly nutritional cooking event with a focus on seasonal eating, helping you to make healthy eating choices all year 'round! Yes, it is possible to indulge your sweet tooth without overloading on refined sugar. In this workshop we’ll explore different kinds of natural sweeteners and you’ll learn how to make desserts that are delicious and (surprise!) good for you. Join Integrative Nutrition Health Coach, Amber Robertson with Bliss Holistic for an interactive discussion and cooking demo that will delight your sweet tooth. The best way to promote better health and nutrition is to eat in-season with local ingredients. That's why we're partnering with the Nashville Farmers' Market and Bliss Holistic Integrative Nutrition Health Coach, Amber Robertson, to discuss seasonality topics and tasteful new recipes! 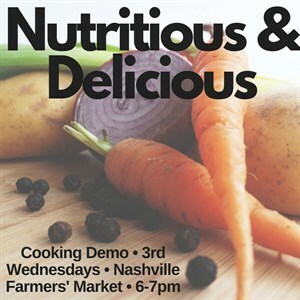 This cooking demonstration will feature locally sourced ingredients that you can also find at the Nashville Farmers' Market. This month's topic is Nutritious & Delicious Desserts! Please RSVP to help us ensure accurate headcount for food samples! Difficulty: This is a social, educational event designed to introduce participants to a range of nutrition topics. Registration Deadline: There is no registration deadline, walk-ins are welcome, those who have RSVP'd are guaranteed food samples! Group Size: Event capacity is limited to 40 foodies! Parking: There is free parking available in the parking lot in front of the Nashville Farmers' Market. Children Policy: This event is open to all ages with parental participation. Weather Policy: This event is indoors. Cancellation Policy: If you RSVP and can no longer make it, please email Teamlightning@Lightning100.com. Farm Sheds where you'll find farmers selling fresh produce, dairy, meats, and other farm goods. NFM's Market House which hosts 16 restaurants and shops selling prepared-foods, sweets, a new craft brew pub and other goods. NFM's Grow Local Kitchen which offers opportunities for hands-on culinary classes, demonstrations, production, and pop-up restaurant rental. The Plant/Crafter/Flea Market features up to 50 merchants selling goods weekly. The market is open 362 days/year, so be sure to stop by anytime to eat, shop, and explore! Registration is encouraged for this workshop. Please RSVP here.